Right now eggplants are the most popular items at the greenmarket. I do my price checking in the morning and by the time I pass by again during lunchtime they're usually sold out by every vendor who stocks them. Most of the prices hover around $2 a pound, but some vendors are selling them for $6-$8 a pound and they still sell out. I'm amazed at how prolific the Hansel eggplant are, they're well suited to container gardening and you get a lot of produce from one plant. 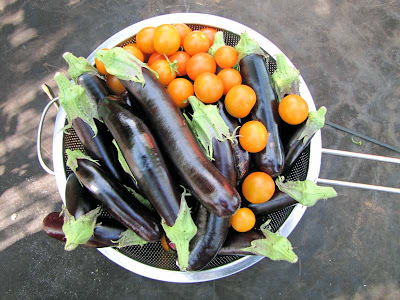 If you're an eggplant lover one plant could sustain you for the entire growing season. I may grow them again next year, maybe their sister Gretel too. The Orange Paruche cherry tomatoes are fantastic, they mature to a beautiful, bright orange and when you bite into them there's faint taste of citrus. Delicious. The plant itself seems to be fine, after dealing with it's magnesium deficiency and phosphorus deficiency, I watched it like a hawk for weeks. Now I'm starting to think I'm just being paranoid about every little thing it does and need to chill out and let it do its thing. The jalapenos are doing great. They aren't bothered by any disease or pest. In my limited experience I would have to say they're the easiest thing to grow in a garden. Some bell peppers were ready to pick, but I decided to wait until they change color. *Not a lot of vendors are selling these items right now so this average will change over time as I'm able to to collect more prices.